Garrick Loewen - 2nd At Worlds!!! end of August and finished with a Silver medal, just 40 seconds behind the winner Jack Toland of the United States. We have been working with Goewen since the LPC Training camping in January this year. A Kinesiology student at the University of Windsor he is dialled in. Finishing 2nd overall against the best in the world - 74 athletes in total. Garrick is quiet, mild mannered but a beast when it comes to training and racing, great things ahead for sure. Congrats Garrick!!! 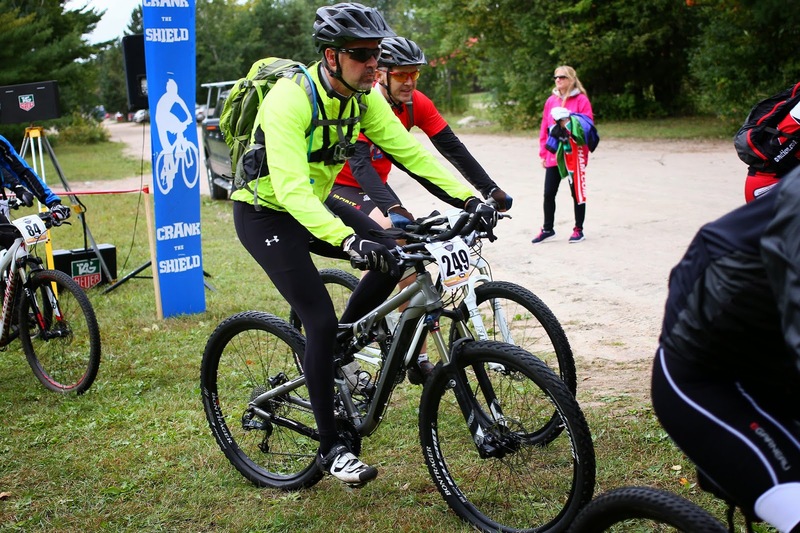 So it all started after a ride at Novi Tree Farm in May, following our group ride in preparation for the 24 hr Albion Hills Relay, we were at the Lakeview Bar and Grill. Of course we were refuelling after a hard ride at an awesome trail that never seems to hold water, no matter how much it rains. 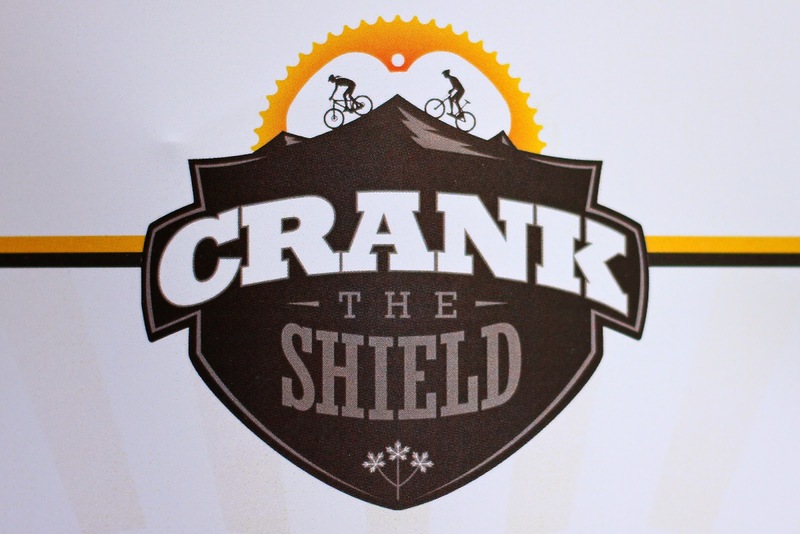 Over a beer, Scott Lamont makes me aware of the 3-day stage race, called Crank the Shield. I couldn't commit on the spot, but he said if I were in, he would go for sure. A few weeks later, I had the approval at home and we both signed up, as Team Sweat Logix, in the 80-99 year team (total years of our ages) category. 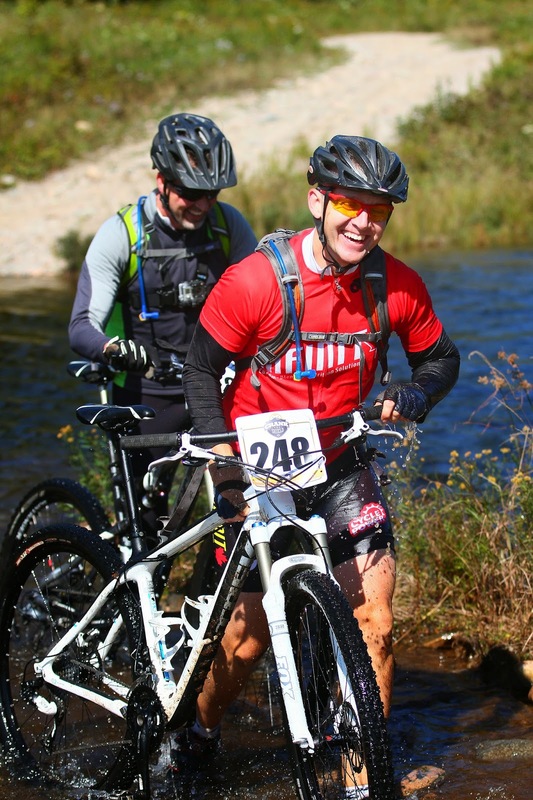 How do you train for 225 km with over 12000 ft of elevation that spans 3 days, on a mountain bike? Still not sure. Scott and my schedules didn't align all that well - we ended up only riding a few times together, but we both managed to get 4-5 rides in a week, with long rides topping out between 3 and 4 hrs. A key staple for the training was Mt Malden (old garbage dump that is a park). It has an elevation of 100 ft. We would ride this continuously, often over 20 up and downs in a row, doing what we thought would prepare us for the terrain we would experience up in the Haliburton Forest. Did it? I guess?! 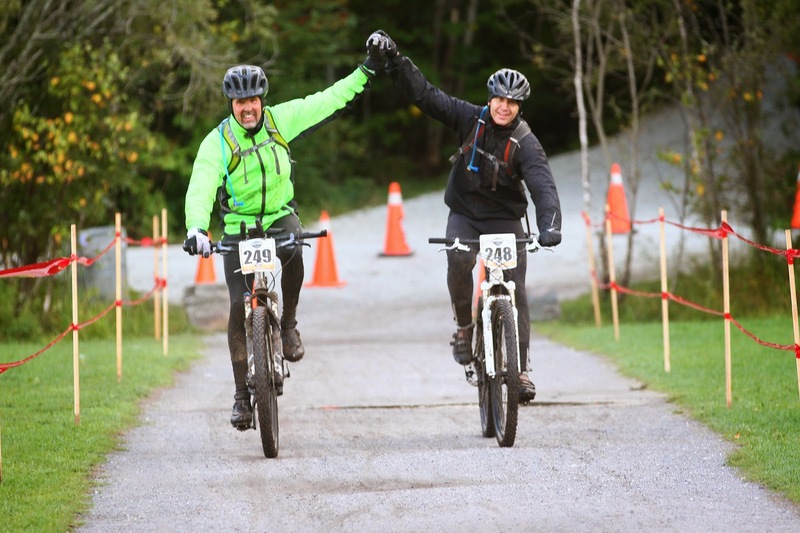 One of the hardest events I have ever done, our finish time for the 3 day event 19 hrs 48 minutes. Hats off to the organizers of the event - Sean and Adam from Chico/SuperFly Racing. Not sure the final tally of riders - between 200 and 300, for sure. Must have been like herding cats, but was like clockwork as far as organization - if only next time they could control the weather. Thanks to Ted from Apex Photography for capturing all my grace and glory!!! time, while pedalling - water up to the hubs. A slight bobble, 6 feet from the end and... Crap, I am going down! I fall to my left, nail my left knee on a rock and the majority of my body is under water, not cool. Correct that. Actually it was - quite cold! The best part of it? 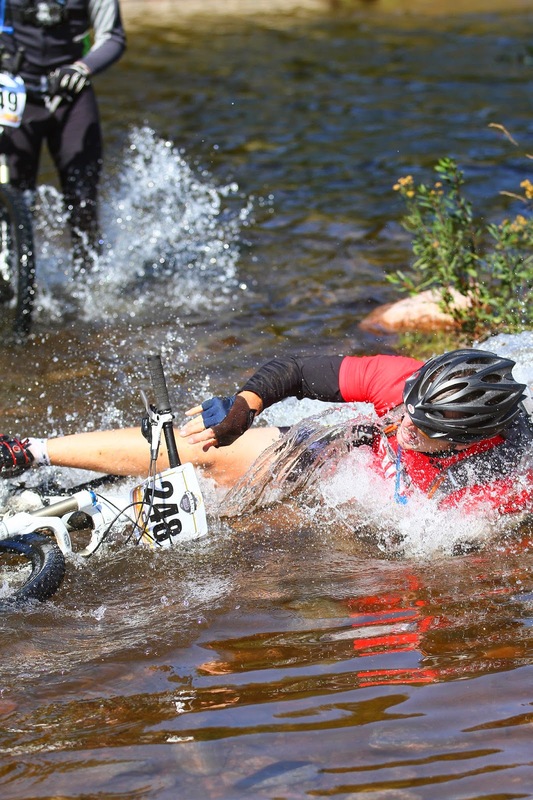 Ted from Apex Photography was there to capture it all - from my controlled riding to my graceful fall and then picking my soaked body up out of the drink - all on camera. So glad it was. As we move from there - a little cold with some down hill speed - we continue on for another 30 km of trails. Then we hit some real Canadian Shield. 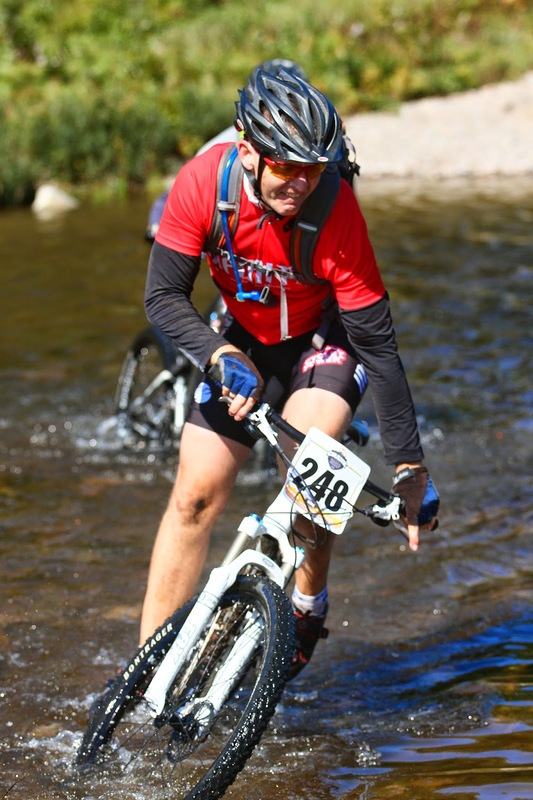 Great stuff to ride when dry, problem is that rock doesn't absorb water well. For the last 20 km we are faced with snowmobile/ATV trails that are completely saturated from the week's earlier rain. Ride 50 meters, hit mud bog that is 1 to 2 feet deep. Repeat this 15 to 20 times - frick! Finally we get to Camp White Pines - just a few more km's of single track and the first day is in the bank - 6 hrs 44 minutes. Wash the bike, drop it off at the Norco Race Team trailer to get some new brakes, get settled into cabin, have a shower and get to the mess hall for dinner. Its now 7 pm and, wow, I am tired. While enjoying a well deserved beer and dessert, Adam takes us through what we can expect tomorrow - pretty daunting actually. 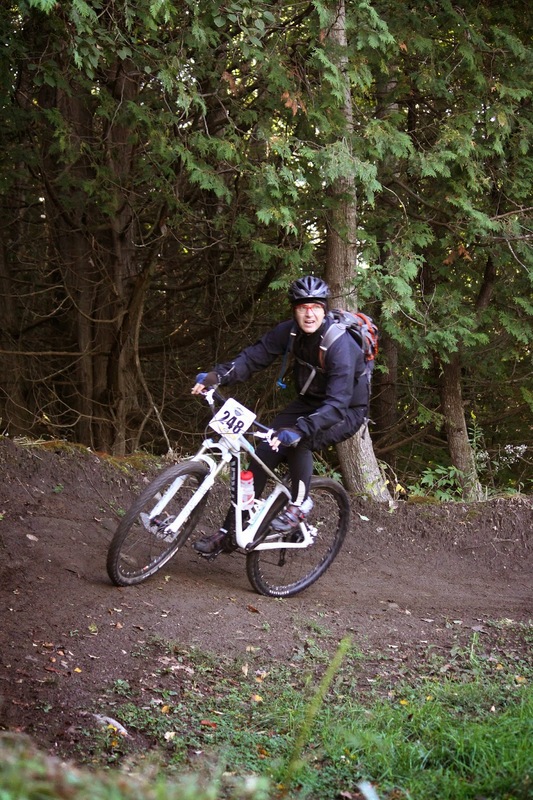 We have 80 km, similar trails, but wait... the rain is going to start at 10:00 a.m. and end at 6:00 pm. That lines up perfectly for race start and end for us. Nighty, night! Finally - wet and tired. Scott did a great job, gutting it out. Why are forecasts always right, when they are bad? 5 minutes before we have to get on the bikes to get to the race start, about a mile up the road the rain starts. And it's about 6 degrees - delightful! I will not bore you with the details - lots of up and down, and mud, of course with the rain - stuff that, like yesterday, I couldn't ride. We finished up this time at 6:59. This means we could wash our bikes, shower and be in time for dinner tonight. Dinner - varied menu, good solid eats to top our reserves back up, a beer and dessert during the course update for tomorrow. Temperature was already down to 5 degrees. Did I tell you there was no heat anywhere? This a summer camp - something I was not prepared for. Scott looks at me at 8ish and says: 'You know Darc, all I want to do is get in my sleeping bag and go to bed.' This was fine with me. Free beer, and we are in bed at 8:30! Meg, one of our cabinmates left to stay in a heated cottage 30 minutes away (who could blame her!). This freed up a sleeping bag for me - the two I had for Saturday night's sleep was bang on. Slept like a baby until the alarm went off at 6:00 am. The two hardest parts of day 3 - getting out of the sleeping bag in the 2 degree C cabin and putting on my wet, cold tights - had to be done though. Strava said we climbed 4600 ft total. After Sir Sam's we hit some road - mostly gravel with a ton of climbing to the Hydro-Cut. We were doing the same track but in reverse, which meant up! Got to the Beaver Damn and decided to walk it this time - once bitten... It was tough riding on day 3. We got to Ben's Trail and The Pass - craziness! Some sections, it was all I had in me to push or carry my bike up - I'd never seen anything like this. Nasty. After this, we hit the last aid station. These were great. The volunteers - awesome. Chips, snacks, and beverages - of course I was all good with Infinit. So the word was - you have 17 km to go. Over 200 km down and 17 km to go sounded great and horrible at the same time. 8 km of this was some hard single track on Normac - which was the last shot to the gut. By the time I got there - things that are normally ridable, had me walking - I had made it this far without any major damage. I wanted ot keep it that way. In total I fell hard to my left 2 times, fell to my right 2 times, and fell back on the rocks once (thanks Camelbak for saving me). Oh yeah, and did two endo's. One of my endo's was because I didn't remember to unlock the front shock - rookie mistake! So I chose to walk some of the final descents as I wanted to go home in one piece. We thought that day three was going to be a little easier - maybe be in around 5 hrs... not so much. Finished at 6:04. Wow. Epic. 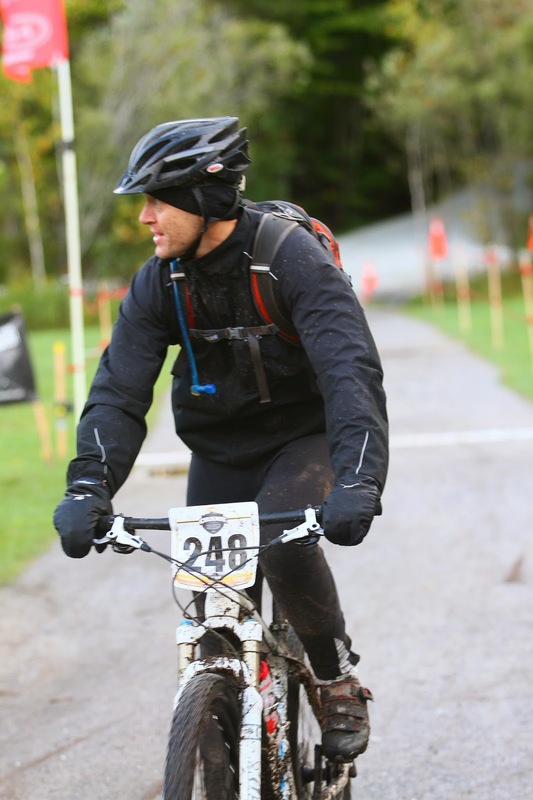 In total, we covered 220 km, and climbed 12000 ft in mud and rain for 19 hours, 48 minutes. Both Scott and I had huge smiles on our faces! Crazy when you go this deep, the cold, the rain, the physicality - it all makes you appreciate all the good around us. Can't tell you how great my bed felt after the 6 hr drive home. The shower in the morning was the best ever. 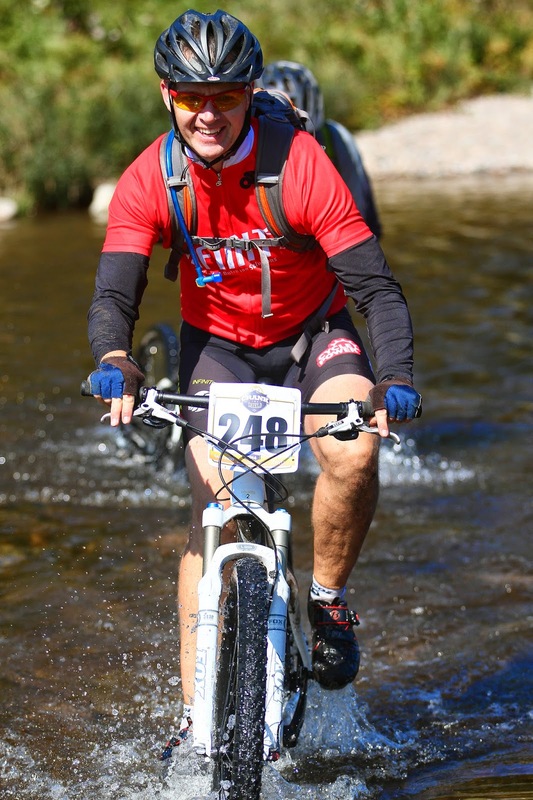 Had a blast - thanks to Scott for being a great riding partner. 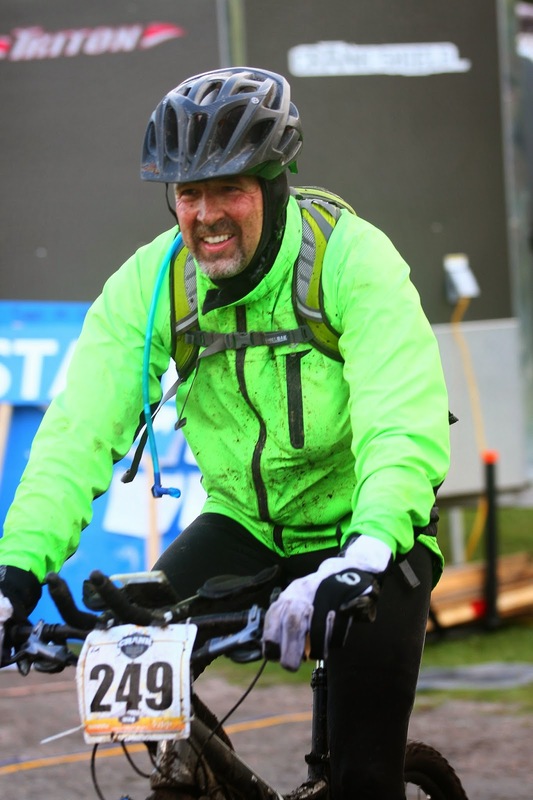 Thanks Sean and Adam for putting on a seamless race, and thanks to Ted for capturing my soaking. 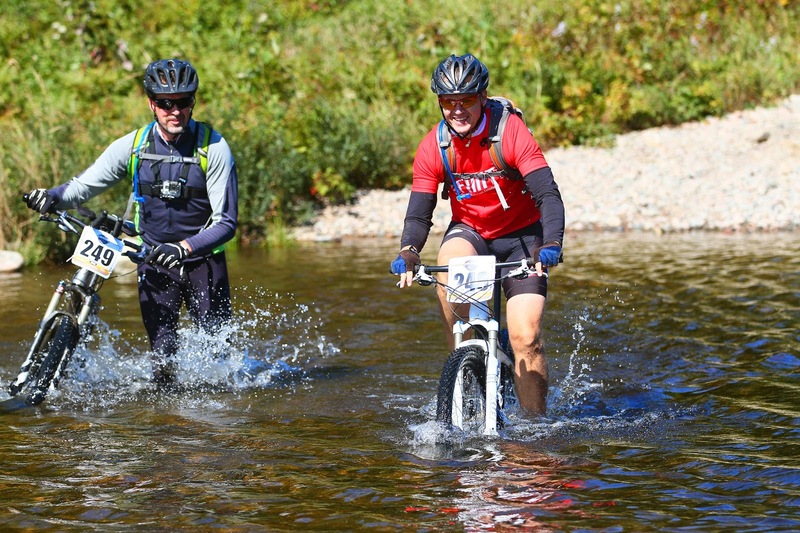 If you are ready to go deep, get cold, dirty and explore your limits, perhaps Crank the Shield 2016 is for you! Sharon knew she was in good form heading into last week's final she was hoping to get on the podium. "Winning the event blew me away", stated Styles. 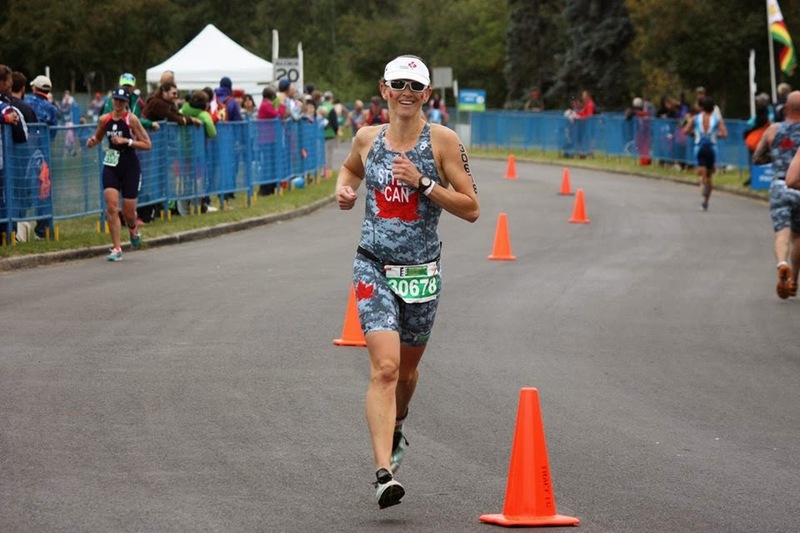 Sharon participated in the 35-39 Female Triathlon category and beat her nearest rival by 2 minutes. Quite a performance: 4th fastest swim at 23:09, 2nd fastest bike at 1:02:40 and the fastest run at 40:12. Throw in a really tidy performance in T1 and T2 - it was enough for a clear victory. 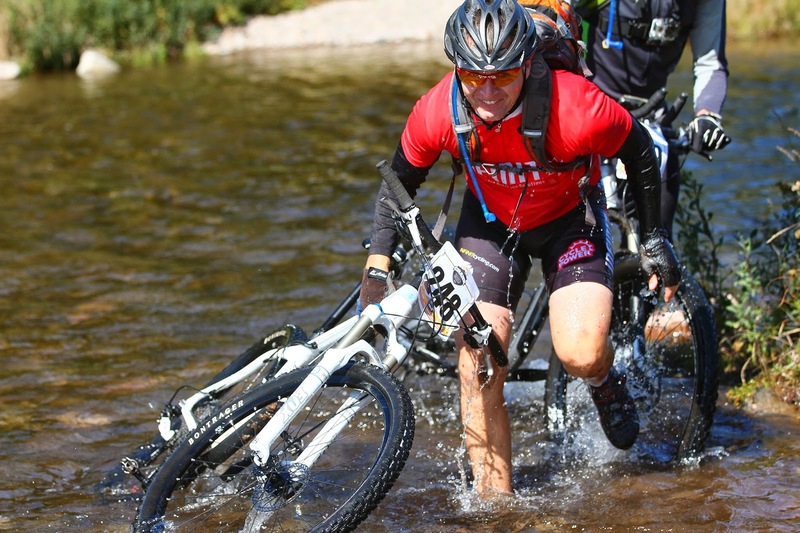 Sharon, a TeamTriLife athlete, has been using Infinit for 4-5 years now. Angie Anderson and the Team have been big users and advocates of our products/approach. www.teamtrilife.com Really cool seeing this result. Here is a link to the highlights of the overall event - some great racing for sure. The Edmonton Team did an incredible job hosting the event and showcasing Canada. Hope you get a well deserved rest, Sharon - Congrats and thank-you for sharing. Hydration and Fuel - Feel the Difference!!! Some of you know that my involvement with Infinit Nutrition Canada started first as a customer. 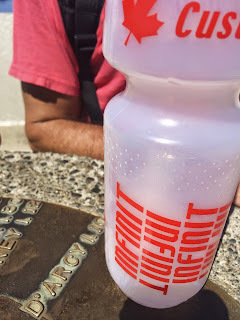 I was training for my 4th Ironman and felt my progression was being limited by my nutrition - that all changed after receiving my first bag of Infinit. I felt stronger during my long bikes/runs and could not believe the difference in my recovery. My season took off - I PB'd by 45 minutes in 2005, yes I worked hard but my nutrition fully supported my every step. 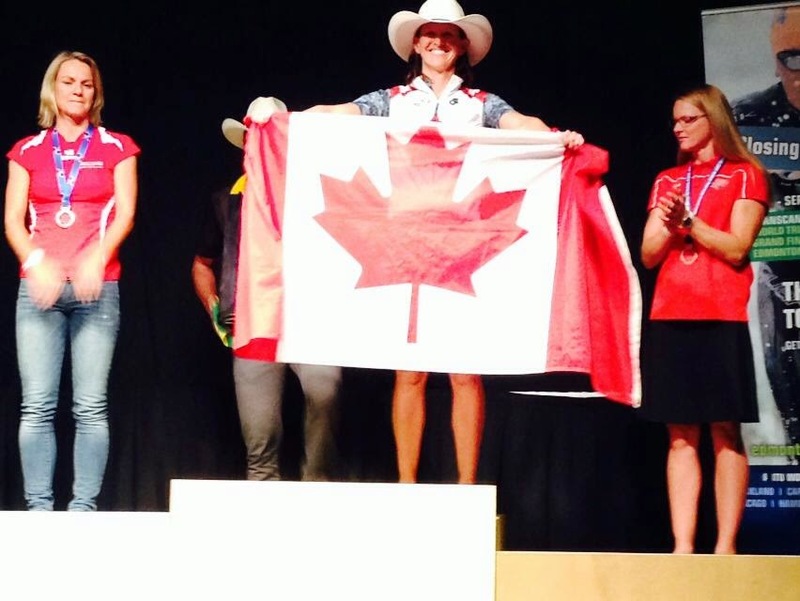 After another great season I decided to bring Infinit Nutrition to Canada, so glad I did. The preamble above is only to let you know that I am involved in sport and I am happy to say after a 4 year hiatus to competing that I am training for the Toronto Scotiabank Waterfront Marathon. I am in my last couple of months preparation for my marathon. My goal is not as lofty as 2005 when I qualified but am hoping to get a dear friend to 3:30 which will qualify him in his age-group. We still have some work to do, I believe we are fit enough to run a 3:35, we need to find another 5 minutes! Roy and I run 3 times of week, I am a less is more type of guy when it comes to run volume. I cycle a lot and figure these 3 quality runs will carry us to our goal, as it has in the past: track workout, tempo run and long run. In our neck of the woods, Windsor we have had a relatively cool summer, not until recently have we been hit with the 30 plus days with high humidity. As we have ramped our long runs up you really get to feel the difference solid nutrition and hydration has on your actual run performance, how you feel for the rest of the day and how your recover the following day. Just over 3 weeks ago I had a 16 mile run and hit one of those days - I ran alone later in the day as I had other obligations earlier in the day - I dropped two bottles, wasn't thinking, this wasn't nearly enough for the 2:22 minute run. First part was great, but by the time I hit 10 miles I knew I was in trouble. With the added heat I was losing more fluids than I planned for. Despite pushing to go faster to maintain pace between 8:30 and 8:45, my last 4 miles were at 9 min/mile or higher and I felt horrible. It was hard to take in my Repair when I got home as I was feeling a bit nauseous due to dehydration, but I knew this was the only tonic that would help. Actually good to get a kick in the pants every once in a while. The next 3 long runs: 12 miles (step back) and 2 - 18's have been great. Difference - fuelling and hydration levels - for each of these 3 runs I was more diligent in making certain that I was consuming enough. I took in one and a third servings per hour of my custom blend - I got 800 ml of fluids, all the electrolytes I needed and about 400 calories each hour. This made a world of different in my pace during each run, all negative split and how I felt. Right after each long run I was able to enjoy the day fully and I recovered strong, able to cross train the following day. I will complete a blog post in a week or so on a simple fluid loss test, I have shared this with many when we conduct nutritional consults. This is a valuable tool, to know what you need to take in when you are competing in longer endurance events, the longer you go, the more important it is to know your number! I hope I am able to report out in mid October that Roy qualified for Boston with a 3:30, even if we don't get that time, I know that we will be running fully fuelled, hydrated and to our full potential. Infinit Hockey - So It Begins!! Since 2009 we have been fuelling elite hockey players, including Dougie and Freddie Hamilton. Back then they were both in junior, looking to use products that were free of banned substances and that would fuel them to their full potential. Lots has changed for them - Dougie is going into his 3rd NHL season as a Top 6 defensemen with the Bruins and Freddie is expected to see his second year of NHL play with the Sharks. Both brothers hit the gym hard in the off season, we were part of that fuelling strategy as well, they leaned on a new Strength blend called Rescue that is loaded to support full muscle recovery even after the toughest of weight work outs. They both go off to their respective training camps Sept 10th, we are looking forward to another great season. The same blends that we created for the young men back in 09 have become the backbone of the hockey program. 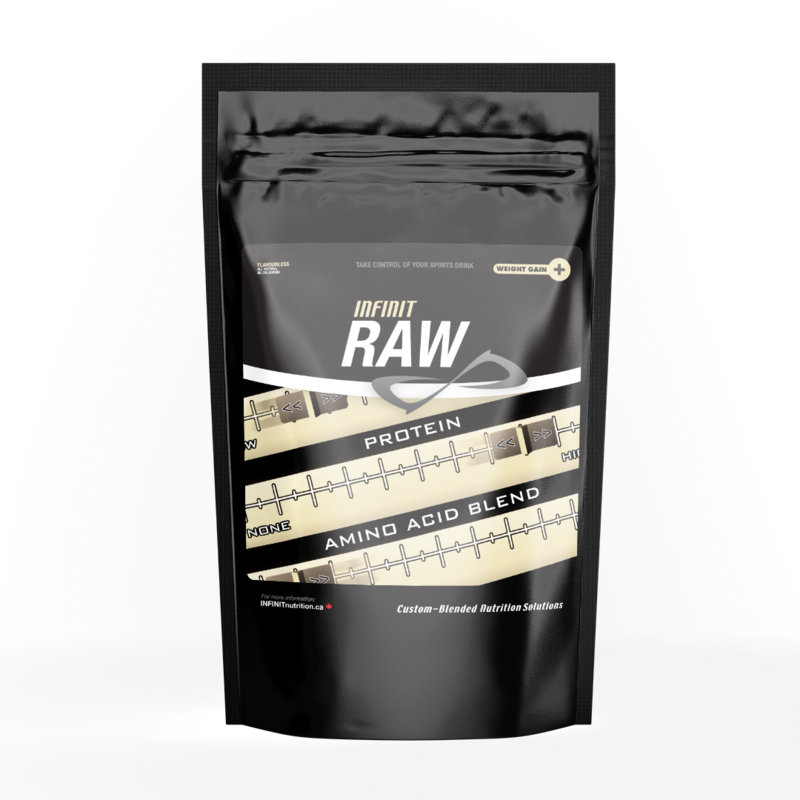 This season we have launched our retail program with Infinit Ice, Infinit Repair and Infinit Raw. We are thrilled to bring on our first two retailers: The Hockey Shop at Leaside Arena in Toronto and in the Proshop at the Buckingham Sports arena at Downsview park also in Toronto. We know that our hockey line will make a huge difference in any player's game. 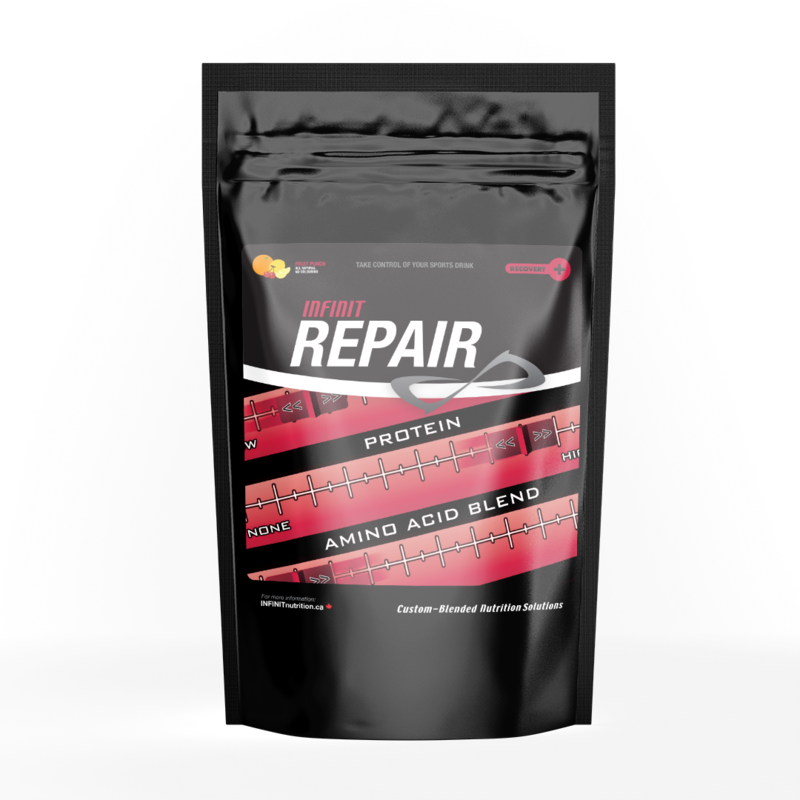 Perfect recovery product for intense efforts lasting an hour or longer. In tournament situations, great product to take if you have 2 hours between games. 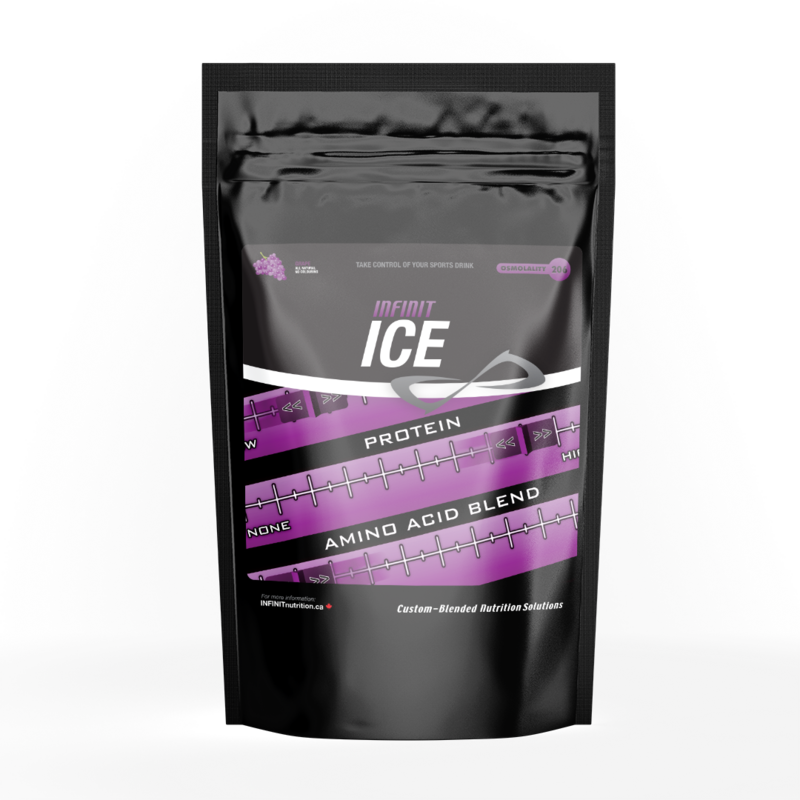 Fruit punch flavour - remember for best results, recovery is best ingested less than 30 minutes from getting off the ice. Our season has started with a bang creating key partnerships in a couple of Toronto's busiest arenas. We hope we can help you be at your best this season.